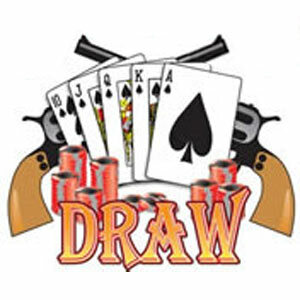 The Basics of Draw Poker …. Players receive a number of cards face down which only they can see. A number of drawing rounds take place where players are given the option to swap any number of the cards in their hand for new cards from the dealer. Two players each hand are selected to put “Blind Bets” into the pot before the cards are dealt. Draw Poker is one of the oldest forms of Poker and is still a popular variant of the game today. Although it has been surpassed by other games such as Texas Holdem and 7 Card Stud you will still find Draw games being played in both online and in offline casinos. Draw Poker history dates back to the middle ages and was also famously played in the Wild West era. How many Wild West films have you seen where poker is being played in Saloon bars? Well that is 5 Card Draw Poker being played right there. Up until the beginning of the 1900s Draw Poker reigned supreme and was the Poker game of choice just as it had been for the past two Centuries. It wasn’t until later in the 1900s that other games started to take over, firstly Stud Poker and then Holdem Poker. Draw Poker games involve each player being dealt a complete hand before any betting commences. Each player’s hand is private and dealt face down to them so only they know what cards are held. Players are then given the opportunity to replace any of the cards in their hand by swapping then and “drawing” new cards from the deck of unused cards. Players attempt to improve their hand by discarding the cards they don’t want. Because all the player’s cards are private in Draw (unlike in some other poker game variations) the game relies a lot on the ability to read the mannerisms and actions of the other players to try and judge if you are holding the best hand. Draw poker is also played with Blinds where a different two players each hand are selected to put in Blind Bets before any cards are dealt in order to ensure that there is money in the pot on every hand for someone to win. 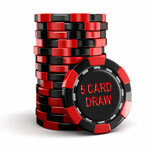 If you are just starting out in Poker and looking to learn Draw Poker then we recommend that you start by learning how to play 5 Card Draw which is the easiest to learn and then by learning how to play 2-7 Triple Draw as it is currently the most popular Draw Poker game played.